Every year many UC academics visit secondary schools around Aotearoa New Zealand to share their specialist knowledge and expertise with students. These invitations often come directly through the academics’ own networks and connections, but some school visits are arranged through UC’s Liaison team to coincide with when academics are speaking at UC’s regional information evenings. This year, Liaison is trialling a new way of promoting visiting speaker opportunities to schools through a new webpage and online booking form. The page lists available speakers, photos, short bios and possible speaking topics. Creating this page, means we can add additional speakers at different times throughout the year, so if you are interested in Liaison helping to arrange some school visits for you, please contact your College Outreach Co-ordinator or email liaison@canterbury.ac.nz. Visits are usually around one hour of class contact, but can vary. Where and when you are available for visits. If you prefer, you can continue to arrange your own visits, but it will be helpful if you can email liaison@canterbury.ac.nz with brief details of the school/class you visited/are visiting, as this can be useful knowledge for Liaison Officers when they are meeting with school staff. Is there a future student in your life? Is there someone in your life interested in studying? UC Open Day | Rā Tōmene on Thursday 12 July is the best way for your children, whānau, cousins and friends to discover study options at UC for themselves. On Open Day, (nearly) everything is open. They can find out about study options and support services, ask questions and explore labs, workshops and studios. On Wednesday April 11 UC’s sport science lab hosted 70 Canterbury secondary school students as part of New Zealand’s second annual National Biomechanics Day. As part of a MBIE funded national project, The Big Experiment, students wore IMeasureU sensors and vertical jumps were recorded of around 1000 national participants. Students visiting UC were put through their paces through maximum power cycling tests, used a radar gun to measure throwing speed, and compared this to their grip strength. Christ’s College students also tried out the Zepp golf swing app, supporting their NCEA biomechanics unit on golf, while Hillmorton High School checked out their balance and stability using UC’s new slackline. Burnside High School’s senior science students also participated in NBD. UC’s tuakana and sport coaching students led the activities. A very enjoyable day was had by all, evident from the smiles all around and some huge efforts from students during each session. The rain, hail and sleet couldn’t dampen the spirits of 900 Year 12 students, who attended UC Discovery Day on Tuesday. We had 20 schools on-campus and a total of 870 students – unfortunately Mount Hutt were unable to attend as their school was closed with the snow! There were 40 sessions throughout the day, with over 60 UC staff and students involved in delivering the event. A big thank-you to all staff who were involved – your efforts are much appreciated. If you were involved, it would be great if you can please complete our staff survey here. The initial feedback from students and careers advisors was that they had a great day, always knew where they were going and really liked the sessions. The visiting students created quite a buzz of energy in the Core, with the student atmosphere one of the main highlights of the day. We also saw quite a bit of interaction with the chill out zone in the Core and smiling faces through the windows of the lecture theatres. 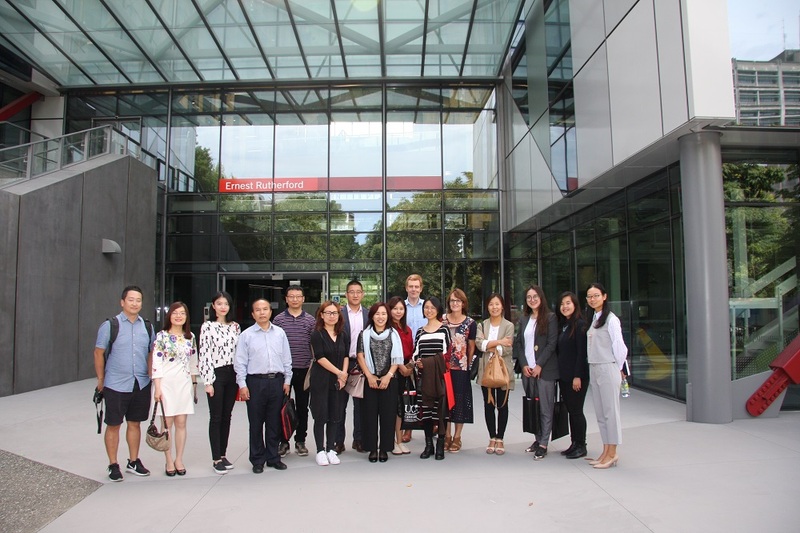 On Thursday 1 March the IRO hosted 11 counsellors from international recruitment agencies in Auckland. This gave us a chance to showcase the campus and for the Counsellors to meet with key members of the teams that they work with. Admissions, Conversion Management, EDP, the College of Business and Law and College of Science were all in attendance at the informal meetings in the morning. Ian MacDonald joined us for lunch in the Shilling Club, and Elizabeth Zou our on campus Team China rep and Lydia Liu of UCIC took them on a campus tour, that included a walk around the Ernest Rutherford Building. The campus was much admired and the day was rounded off with a city tour. where we took the opportunity to show just how far Christchurch has come.